Imax technology was invented in Canada so this is a good place to take in a few Imax movies. There were two imax theatres in Vancouver, the Imax and the Omnimax. The Imax theatre at Canada Place closed in November 2009. 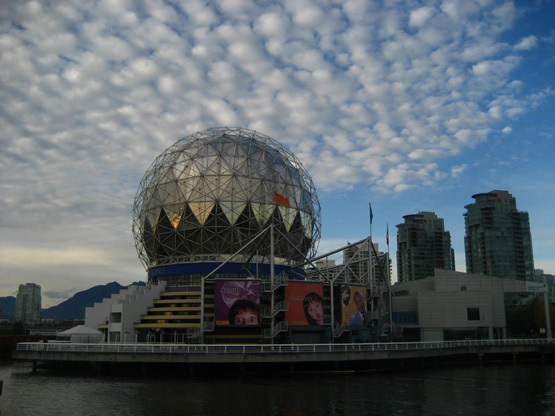 The OmniMax theatre still operates at Science World. The Omnimax theatre is located at Science World, 1455 Quebec. The difference between the Imax format and the Omnimax format is that Imax movies are shown on a huge, flat screen in the way traditional movies are shown. Omnimax movies are shown on the curved roof of the giant theatre. The result is that Omnimax seems more to engulf the viewer than Imax. The downside with Omnimax is that some people feel a bit queasy after watching an Omnimax movie. Omnimax offers double bills on certain nights, notably Sunday and Wednesday. Call for programs. 604-443-7443.